IOTA is a completely new and innovative distributed ledger technology designed to improve on the limitations of current blockchain design. The highlight of IOTA is the Tangle, IOTA's answer to the blockchain, in which tokens can be transferred without any fees! This enables micro payments which is ideal for the Internet of Things economy, which is one of the primary industries IOTA targets. Here is a brief history of IOTA: founded by 4 individuals: David Sønstebø, Sergey Ivancheglo (@come-from-beyond), Dr. Serguei Popov (@mthcl), and Dominik Schiener in 2015. This team has been involved in the crypto space for years and was also behind NXT and the Proof-of-Stake algorithm, which many coins currently use. Working on a stealth microprocessor, Jinn, IOTA was born out of necessity for a compensation layer in the Economy of Things. IOTA held a crowdsale in November/December of 2015, which it raised a total of 1337 Bitcoin. The devs and founders as well had to participate in the crowdsale as nothing was held back for a premine or for the Foundation. 100% of the tokens were distributed. 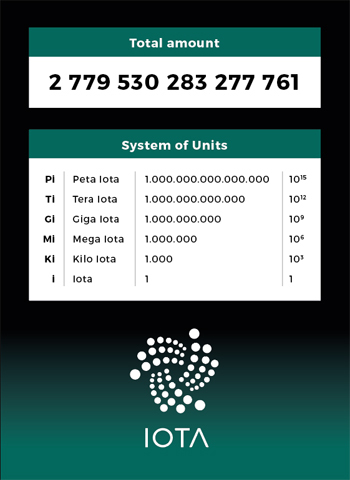 When first launched total supply of the IOTA was 999,999,999.999.999. This was later changed to 2,779,530,283,277,761 IOTA instead to optimize for IoT devices, clarified in this tech update. You can confirm the total supply in the below graphic. Exchanges are currently trading in Mi. Ex. there are ~2,779 Ti in circulation. July 11, 2016 - IOTA main-network goes live. June 13, 2017 - IOTA launched on exchanges (Bitfinex first). July 11, 2017 - Last day to claim IOTA tokens from the crowdsale. "a continuation and expansion of the work that the founders of IOTA has already done including networking, branding, marketing, land deals, getting companies to pilot / adopt IOTA, go to conferences to present IOTA and in general keep the momentum of IOTA going and ensure long term success of the project. " At the heart of IOTA is the Tangle, a blockchain with no blocks and no chain! This distributed ledger technology is based on a DAG (Directed Acyclic Graph), that still functions similar to a blockchain with a P2P network and validation mechanism. Selection of transactions to approve is done by MCMC (Markov chain Monte Carlo) randomization. For consensus, how the network reaches agreement is essential to the integrity of the network. One of the lead developers, Sergey Ivancheglo, gave a Consensus Masterclass, that goes into depth on how this is achieved. For a more in-depth look at the Tangle, you can browse the Tangle Whitepaper. With every token and platform, a roadmap gives investors and developers a picture of where the founders envision they are going. In March 2017, the IOTA Development Roadmap was released. IOTA looks ahead. IOTA uses a hash-based signatures instead of elliptic curve cryptography. They use Winternitz signature which makes IOTA quantum proof. The hash function is called Curl. Quantum computing is rapidly approaching and will continue to enter the crypto discussion more and more. IOTA's quantum resistant algorithm will ensure the protection of its network, data, and transactions. Here is a list of IOTA resources both official and community!